First things first: we don't have anything against bus drivers, but this is clip boarders on the extreme of stupidity. 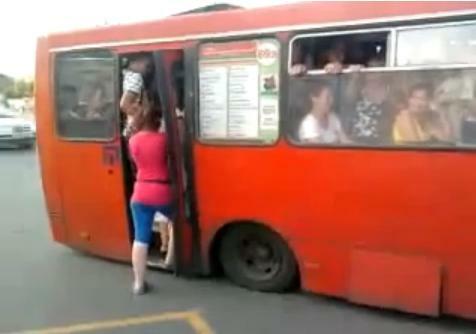 The video shows a few people trying to get into a tightly-packed bus. Realising there's not enough space at the rear, they miraculously make some and a brave lady boards the bus. But look closely and you'll see she's quite literally squashed up against the window. Later on in the clip, the bus driver pulls away, almost colliding with another vehicle. Filed under "Another idiot behind the wheel".